Reviews: PreSonus Studio One 4, Korg ARP Odyssey FS, Vox Continental, Teenage Engineering PO‑33 & PO‑35, ADAM T7V, TK Audio BC1 Ltd, Magix Sound Forge Pro 12, 1010music Toolbox, Universal Audio Helios Type 69, Mytek Liberty DAC, Rob Papen Go2. 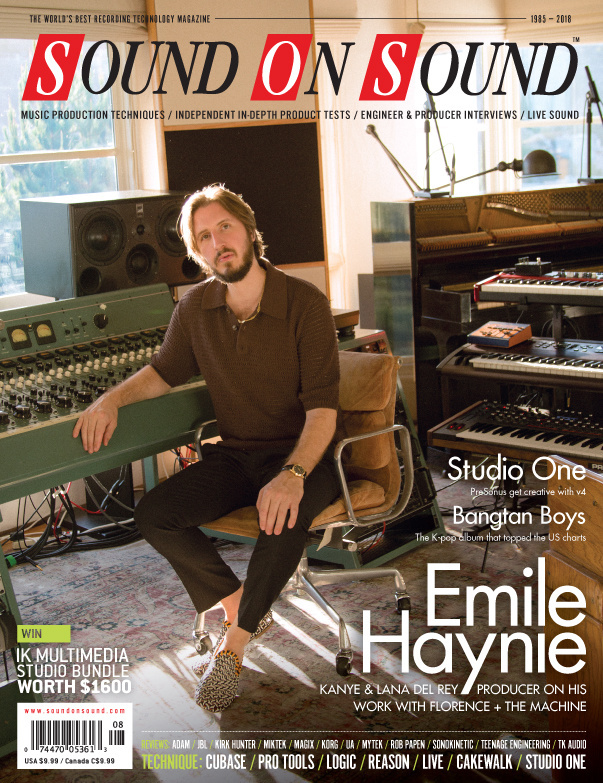 Technique: Emile Haynie: Producing Florence + The Machine (Cover), Marta Salogni, Running-In Speakers, Mixing Vocals: Part 2, Inside Track: Bangtan Boys/James F Reynolds, SpongeBob SquarePants: The Broadway Musical. Sampling veteran Kirk Hunter’s latest instrument aims to cater for all of your violin needs. Meris’s recent repackaging of their Mercury7 500-series unit into a reverb pedal has brought with it stereo operation at both instrument and line levels and a very welcome drop in price. The Ottobit Jr adds stereo operation, a six-step sequencer, a synth-like resonant low-pass ladder filter, triggered stutter effects, 16 preset memory slots and MIDI I/O to the mono original’s variable sample rate and bit-crushing abilities. This classy valve mic is redolent of the classic German designs of old, yet comes at a fraction of the cost. While Lo-Fly Dirt can make things very grungy, it is perhaps more akin to the analogue saturation plug-ins that have become very popular on desktop platforms over the last few years. On offer here is a wide range of more abstract ‘wind-flavoured’ sounds — in fact, just about anything other than traditional brass and wind. Oceania comprises two choirs — men and women — which can be used independently but are at their imposing best when played in tandem. Film scores from the golden era of jazz were the inspiration for Sonokinetic’s latest sample library. More than a mere makeover, this 10th anniversary limited edition processor adds some useful functionality to the original BC1 design. For their latest plug-in, Universal Audio have revisited one of the consoles that defined the ‘British sound’. Bass Slapper is a stand-alone and plug-in (VST, AU, AAX) virtual instrument that, with just a little bit of practice, will allow you to give the likes of Stanley Clarke, Bootsy Collins or Mark King a run for their money. For her eagerly awaited new album, Florence Welch teamed up with one of the world’s hottest producers. Emile Haynie and Florence herself describe the making of High As Hope. Talent and hard work have taken Marta Salogni from dive bars in Italy to working with A-list mixing and production clients in the UK in less than a decade. Brush up on your listening skills, as we dissect some hits from a recording and production perspective. This month: Rudimental, George Ezra, Drake, Ariana Grande, plus Classic Mix: Cher ‘Believe’ (1998). Q. How can I bypass an External FX plug-in in Cubase? Read more about Q. How can I bypass an External FX plug-in in Cubase? Q. How can I expand my Roland Quad Capture via S/PDIF? I have a Roland Quad Capture [audio interface], which I’m very happy with. I would like to use the digital inputs in addition to the two analogue inputs. How can I achieve this? Read more about Q. How can I expand my Roland Quad Capture via S/PDIF? Media content for the August 2018 issue.